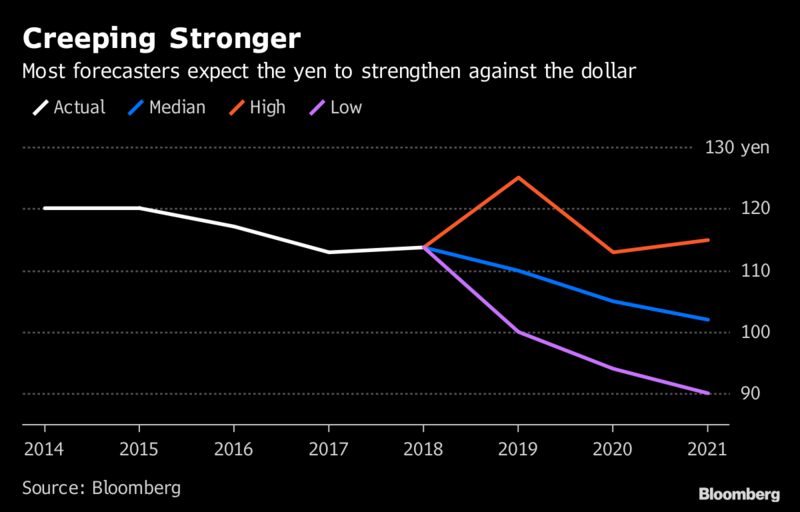 The world’s currency prognosticators appear to agree on at least one major trend for the next couple of years: The yen is going to get stronger. From about 113.30 per dollar now, the yen will probably appreciate to 105 by 2020, according to a Bloomberg survey in which the weakest estimate was for 113. But the more bullish analysts, including Commerzbank AG and Morgan Stanley, see it solidly below 100, reaching levels last seen in 2013. Rather than a result of haven buying precipitated by global chaos, Commerzbank, for one, expects the rally to come from tighter Bank of Japan monetary policy. Couple that with the Federal Reserve’s rate-hike path running out of steam, and Ulrich Leuchtmann at Commerzbank sees scope for 96 yen per dollar by the end of 2020. Busting through 100 yen would be significant, because in recent years traders have speculated that the Bank of Japan would step in to weaken its currency in that area. 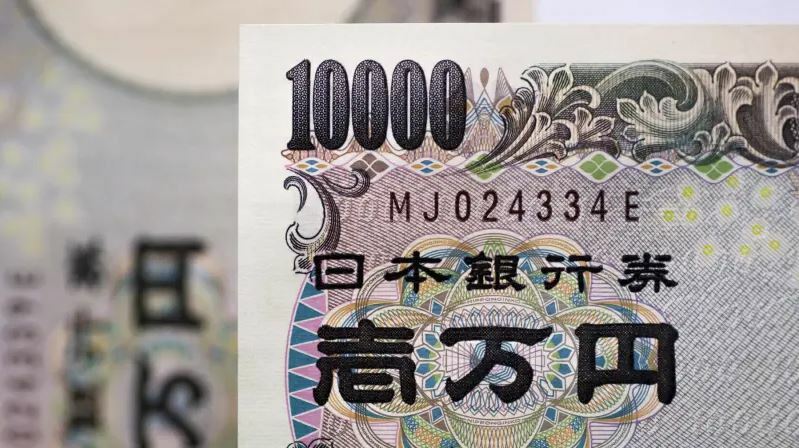 The dollar-yen rate hasn’t closed below 100 for an extended period since 2008-2013, when investors sought shelter in Japan’s currency amid the financial crisis and its aftermath. His bullish view took hold starting in July, when Bank of Japan Governor Haruhiko Kuroda created a more flexible range for yields. Benchmark Japanese 10-year rates trade at about 0.08 percent, compared with as low as around 0.02 percent in early July. The scenario that takes dollar-yen to 96, according to Leuchtmann, is one in which the BOJ is reducing stimulus as the Fed pauses. The market’s movement since Wednesday offer a glimpse into how that may play out. The yen is gaining for a second day after Fed Chairman Jerome Powell’s comments led traders to trim bets on U.S. rate hikes in 2019. In addition to rising yields, an anticipated end to the BOJ’s negative interest-rate policy in 2019 would make the yen “relatively more attractive,” according to a Nov. 25 note from Morgan Stanley analysts led by Hans Redeker. They see the yen appreciating to 94 per dollar by the end of 2020 as the U.S. economy slows while Japan’s improves, drawing capital. Jane Foley, Rabobank’s London-based head of FX strategy, is among analysts holding a dimmer view of the yen’s prospects. She says that for the yen to reach 94 per dollar would require a catastrophic event like a global crisis. And what’s more, BOJ policy will still be looser than that of its peers. She anticipates the yen trading between 105-110 per dollar by the end of 2019. In Tokyo, Daisuke Karakama, chief market economist at Mizuho Bank Ltd., expects dollar-yen to fall to around 100 by the end of next year. But for him, the U.S. side will be the driver, mostly as traders anticipate the end of Fed tightening. It will be hard for the BOJ, and the European Central Bank, for that matter, to normalize policy if traders expect the Fed to halt. “All focus will be on the Fed’s monetary policy” he said.